In 1670, King Louis XIV commissioned the 12 pieces depicting royal households, known formally as “Tentures de Maisons Royales”. Designed by Charles Le Brun, each piece showed a residence of a king. “Chateau Bellevue” was the month of August. Here, Le Brun shows the view from the balcony of Chateau Bellevue, with courtiers going for a ride on the expansive grounds of the estate. By the color of the trees, one can tell it’s the beginning of fall. Le Brun’s composition and elements work in perfect concert with one another. A prolific painter, Le Brun’s works spanned 30 years. In fact, his sense of style captures the very essence of the Baroque period, which occurred during King Louis’ reign. This tapestry comes complete with a tunnel for hanging and is lined on the back. 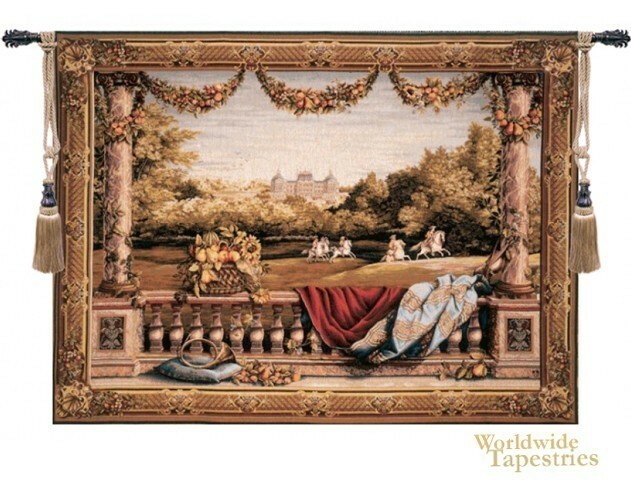 Note: tapestry rod and tassels, where pictured, are purchased separately. Dimensions: W 44" x H 34"
Dimensions: W 58" x H 44"
Dimensions: W 78" x H 58"